iPhone-Backgrounder (available for jailbroken iPhones via Cydia Installer) brings another much-desired functionality that Apple's not allowing for legit apps—the ability to run in the background. This is very usefull for iPhone applications like Skype (Fring), MobileChat, IM+, and many others. 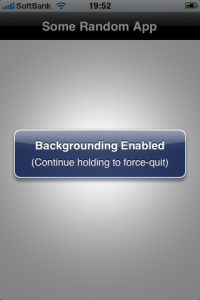 To enable backgrounding for the currently-running instance of an application, press and hold the menu/home button until a message pops-up stating "Backgrounding Enabled". Note that only the current instance will be affected; if the application is terminated and relaunched, the new instance will not have backgrounding enabled. To properly terminate an application instance that has backgrounding enabled, press and hold the menu/home button until a message pops-up stating "Backgrounding Disabled". One possible cause is having the Intelliscreen application installed with the "App Launch Boost" option enabled. This option can be disabled in Intelliscreen settings on the "Performance" page. This is most likely due to the device being low on available application memory (RAM, not disk space). This can be caused by either having too many applications running at the same time, or by using applications that require a lot of resources. Unfortunately there is no fix for this issue, other than to avoid having too many backgrounded applications.